As is tradition, the City presented its annual Robert Moore Award for community service — named after the founder of West Linn — during Mayor Russ Axelrod's State of the City speech Feb. 28. This year's award went to Dave Kleinke, a longtime volunteer in local parks — both individually and through the SOLVE organization. SOLVE Oregon is a state organization that organizes service projects related to the environment. "Because of his efforts (with SOLVE) we now enjoy typically 30-50 volunteers on the first Saturday every month regardless of weather, and we have had up to 300 volunteers working on a single event," Axelrod said just before he presented the award. "At these events he engages and endears volunteers with his service philosophy and his love for the natural world." Like last year's winner, Don Kingsborough, Kleinke got his volunteering career started by pulling ivy, blackberries and other invasive plants at Mary S. Young Park. "He still does this, but soon he took on the SOLVE events and tremendously expanded their volunteer services in West Linn," Axelrod said. Axelrod added than Kleinke has also promoted pollinator gardens around the city and served on the West Linn Parks and Recreation Advisory Board. Meanwhile, Kleinke also volunteers outside the city with the Fathers of the Heart homeless shelter in Oregon City and the Oregon Zoo. "(At the zoo) he serves as a guide, and as a certified diver he cleans the sea life tanks and feeds animals on a weekly basis," Axelrod said. 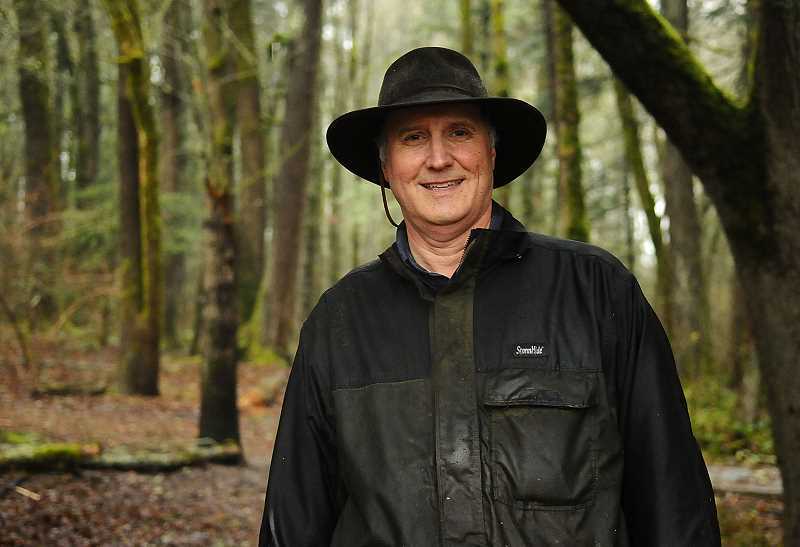 "He also serves on the board of directors of the Clackamas River Basin Council. His passion and basic message is 'stop talking and get the work done,' and he quietly goes about making our community better as a result." The award was created by the City in 2013 and is decided by a vote of prior winners. Robert Moore was known for his selflessness, and thus named the city after friend and mentor Lewis Linn, rather than himself. Past winners include Kingsborough, Larry McIntyre, Dave Kruse, Lisa Clifton, and Alexana Kachirisky.